You might be looking at the "Center for Gender Equity" and feel unsure of where this was during your time here on campus or wondering where the Women's Center site is. The Center for Gender Equity was known as The Women's Center or the Women's Networking Center until Summer of 2017. Why the name change? As you probably knew, the Women's Center was always a welcoming place for ALL, but as language and culture changes, so does our name. Our work has always included work to make sure that our community is inclusive of all genders, and by changing the name to the Center for Gender Equity, we believe it better demonstrates our mission and actions to everyone. Click here to take a look at the evolution of the Women's Center to the Center for Gender Equity through logos! You can also keep track of us and join the conversations online, anytime by following us in these areas below. Thanks for all you continue to do! 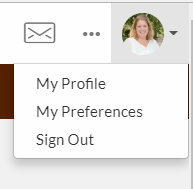 Add your cell phone number in “My Preferences” to receive text alerts when a student asks to connect. Students are more likely to connect to a mentor who has a well-developed profile. Here are some easy steps to take that will strengthen your profile. 1. Include a photo. Profiles with pictures are seen as more valid, professional and welcoming. 2. Connect your profile to LinkedIn. Providing a link to your profile on LinkedIn is an easy way to share more details about your experience and education. 3. Include 1 or more job titles and position descriptions. Mentors are filtered based on keyword or job title, so at least one job title and a brief description of your work are important to include on your profile. Be sure to include previous jobs as well! 4. More About You Section: What activities, offices, or clubs were you involved with on campus? Invitations to future events will be based, in part, on-campus involvement details in this section. Happy Hours, Send Offs, Tailgating: Click here to find the LU Alumni Network in your area! Even if you are not a student at Lehigh but interested in staying connected with the Center for Gender Equity, you can do so in many ways. Want to know what the CGE is doing? Sign up for our Quarterly Alumni Update!